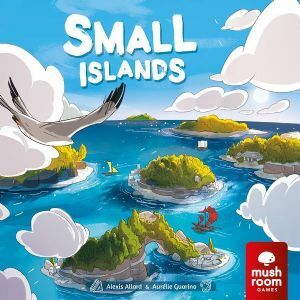 Small Islands is a tile-placement game in which you are daring explorers discovering a magnificent archipelago. Its islands are brimming with natural resources but also temples from an ancient and mysterious civilization. Brave adventurers, bring back to your clan wealth & prestige! A game is played in maximum 4 Rounds. At the beginning of each Round, each player secretly picks an Objective Card out of three cards. And in turn, players draw and place a Landscape Tile out of the 5 available (2 in hand, and 3 on the table). At a certain point, another option becomes available: placing a Ship Tile. When this tile is placed, in turn, all players place Houses on the islands and earn Prestige Points according to their Objective. Then players start a new Round. 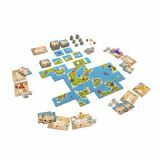 When the game ends, players receive additional points for their Ship Tiles. In Advanced Mode, Objectives are split in 2 types of cards which allows you to create your own objectives amongst many combinations. There is also a Solo Mode, innovative for its mechanics as well as for the very concept of a solo mode in a tile-placement game. We gave it an IA with a personality and different behaviors. Small Islands offers you even more surprises, hidden at its heart.